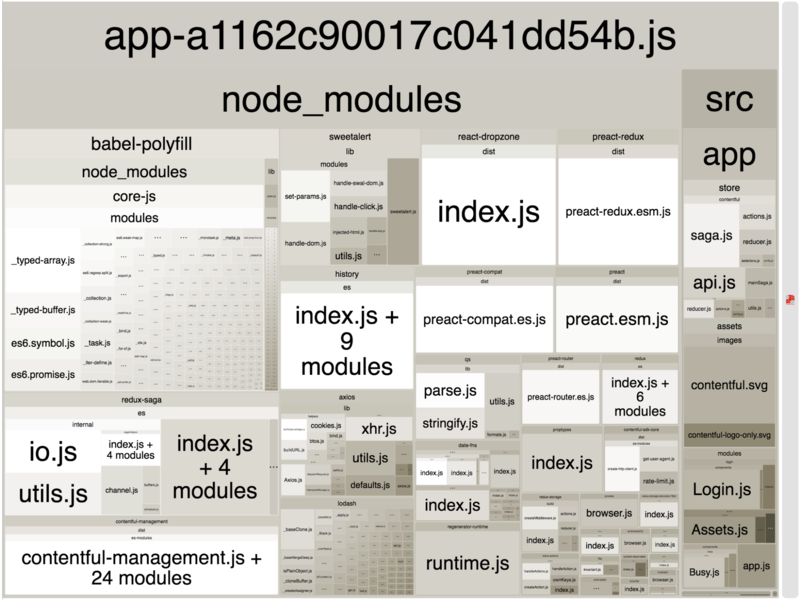 So we’ve performed an initial analysis and explored the use of webpack -p to bring our bundle size down from 1.7MB to 640KB. Then, we learned how to reduce that an additional 80KB by supplying our own configuration. But what comes next? 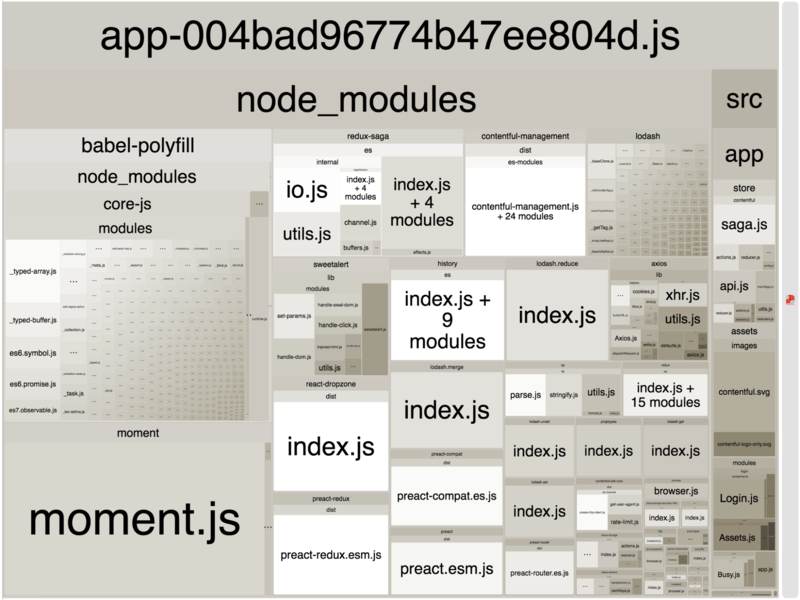 Part three will tackle more detailed optimizations related to some common modules, like Moment.js, Babel, and Lodash. The library supports many locales by default. This is great—but because it’s available in many languages, its payload is rather big. Fortunately, we can fix that. We’ll start by using the webpack IgnorePlugin in your webpack.config.js file to remove any unwanted leftovers from your bundle. You can also achieve the same results using the ContextReplacementPlugin. Let’s take the same example, but specify which variants of the German language we want. The technique used above can be recycled for other dependencies and files that we want to keep out of our optimized bundle. You can find the actual commit on GitHub. This is already an improvement, but the Moment.js module is still too heavy considering we only need one specific date format for our app. Many cases only use Moment.js for very simple date manipulation or formatting tasks. And since Moment.js does not support tree shaking yet, we need to implement another library: date-fns. Date-fns is similar to Moment.js in that they have a lot of overlapping functionality. But while Moment.js exposes one big object that can handle everything, date-fns is built for a more functional approach. Additionally, date-fns supports tree shaking when used together with babel-plugin-date-fns, a Babel plugin that replaces generic date-fns imports with specific ones. Check out the commit for this improvement here. Now that we’ve chosen a lean toolset for configuring dates, we can find other areas of our bundle to reduce. For instance, in its unoptimized state, our example app uses babel-preset-es2015 which was recently deprecated. This means that we must use another solution—the babel-preset-env package. Something to note is the targets.browsers property. This is where you can set criteria for the included Babel plugins. Each plugin from the latest preset can be included if necessary, such as es2015, es2016, and es2017. To get a preview of what browsers your configuration includes, you can use browserl.ist. Pass your browser criteria through as a list separated by commas, and the listed browsers will be included in the config file. You can find a query syntax spec on the browserlist repository. See this commit on GitHub. So the optimization efforts above didn’t help… but why? It’s because there is a common misconception that babel-preset-env v1 excludes polyfills. But in reality, your import of babel-polyfill is not touched at all in version one. The upcoming version two, however, will finally be able to exclude polyfills. To make this work, we have to upgrade to Babel v7. 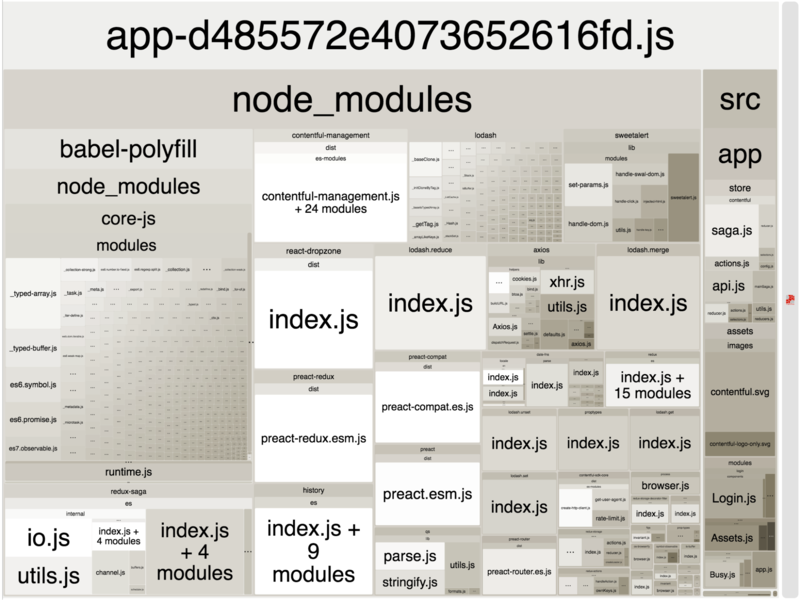 Hint: Do not include babel-polyfill via an webpack entry. Instead, you should have it as an import statement at the beginning of the entry code file of your app. Find the actual commit for this improvement here. We’ve almost reached the 100KB mark for our gzipped size, but we are not done yet—we can still squeeze more out of the bundle. This can be achieved using babel-plugin-lodash and can help to decrease the bundle size. We can do this using the lodash-webpack-plugin which works great in combination with babel-plugin-lodash. Just keep in mind that your other dependencies still might need some of these features. $ npm list --prod | grep "lodash\(\.\|-es\|-amd\)" | grep -v "deduped"
Now create webpack resolve aliases for every package in your dependency tree. To do this, alias them to the cherry-picked version of the basic Lodash package. Check out this commit on GitHub. The pure minified file is now below 300KB and when gzipped, it will send less than 100KB over the net. That’s pretty impressive—but there's always room for improvement. If anyone has any further tricks, start a discussion on our community forum. We've made significant improvements since our original 1.7MB bundle size. We could stop here, but what fun would that be? 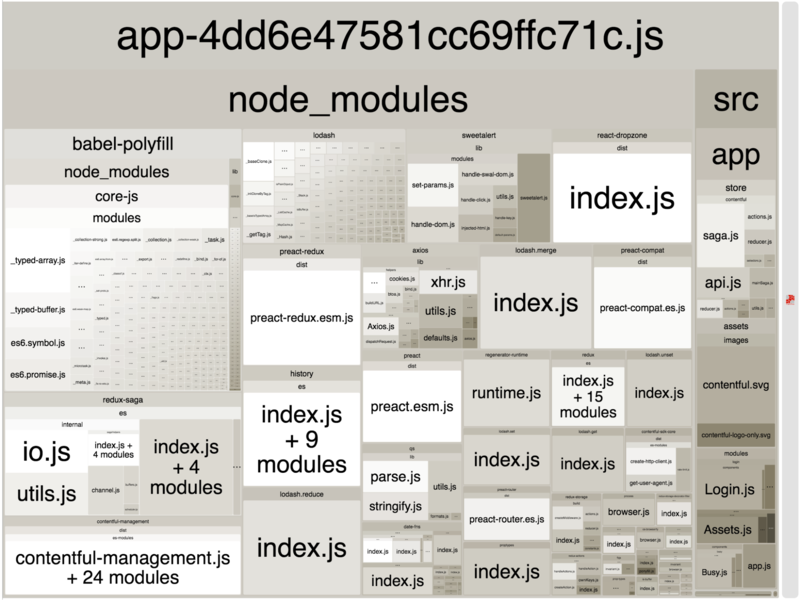 In the next and last article of this series, we're aiming to hit webpack's recommended 250KB parsed size. 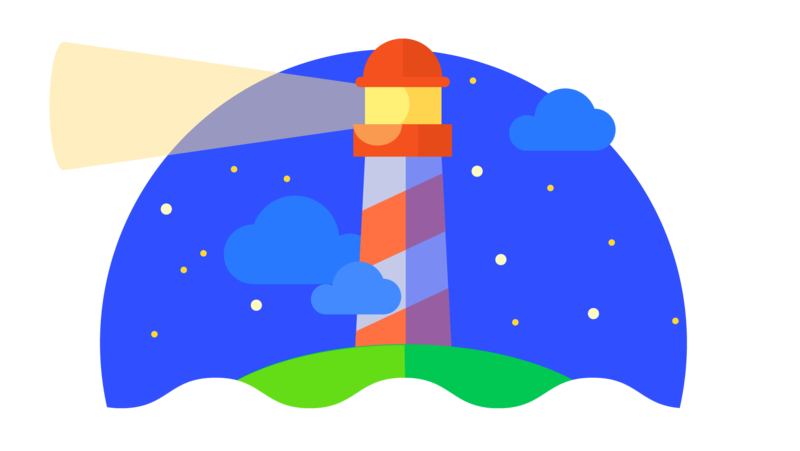 We'll accomplish this by introducing chunk-splitting to enable better cacheability of your app over time and to only send relevant code to the user. Check back on the Contentful Blog next week or follow us on Twitter to stay updated.